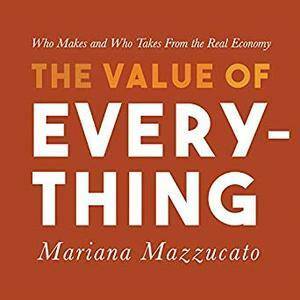 Mariana Mazzucato, Randye Kaye (Narrator), "The Value of Everything: Who Makes and Who Takes from the Real Economy"
The Value of Everything argues that American companies have for too long been valued according to the amount of wealth they capture for themselves rather than for the value they create for the economy. In fact, Pfizer, Amazon, and other companies are actually dependent on public money, spend their resources on boosting share prices and executive pay, and reap ever-expanding rewards without offering the market value. In her previous work, The Entrepreneurial State, Mariana Mazzucato argued that public investment has been the most significant driver of innovation and product development. The iPhone as it exists would not have been possible without government-sponsored technology like Siri and Touch ID. Yet Apple today, like numerous other companies, is engaging in a massive repurchase scheme, and for the first time has prioritized value-extraction practices such as spending to boost shareholder profit-the very initiatives that funded their software. If private companies continue down this path, they will succeed in diminishing the size of their largest and most successful investor - the state - and will destroy powerful opportunities, shrivel markets, and depress wealth.